There are two parts of the plan that are of interest to drivers, riders, bikers, and walkers and to Eliot specifically. All users will be affected by the proposed changes to the Box. ALL of the existing overpasses in the Quarter will be demolished and rebuilt so the freeway lanes can be increased. After construction is complete, Flint will terminate at Tillamook. It will not connect to Broadway. Instead, Hancock will be extended across I-5. The southbound ramp will relocate from Ramsey/Winning Way to Williams. Truck traffic from Lower Albina will also be rerouted from there to Weidler to access the freeway. Traffic lanes on Williams in the box will be widened to allow two-way flow in a “contra” direction (right lane will go north and left lane south). These new lanes will be on a wider overpass forming a “lid” over the entire freeway. That lid can support new buildings and park-like features. The Hancock overpass may include another lid (see next section, “Flipping Our Lid”). The map provided and plan just described, was in the NE Quadrant Plan adopted by City Council. It will be used to prepare funding requests and environmental statements (EIS). The EIS is expected to be issued between November and February and will include public comment opportunities that may change the plan. The Rose Quarter has discussed options with Transportation staff already, as this plan potentially isolates their primary parking structure. Although they would be happy to see truck traffic off of Ramsey/Winning Way, they share our concern that dumping it on Weidler will create conflicts with existing local and freeway bound traffic and the streetcar. Their representatives assured me they want to work with Eliot on mutual concerns this project will create. The project EIS may take 2 years to approve and securing construction funding take a couple of more years. ODOT expects construction to take 3 years, but its record on major construction projects isn’t great. Completion is likely 10 years away. The Land Use and Transportation Committee has been involved in this process since the beginning and would like to hear from you about the entire proposal; especially, about the loss of Flint, diversion of freeway bound truck traffic onto Weidler, the extension of Hancock (and its potential to become a Broadway bypass route), the disruption a 10-year project would create, and the “lid” at Hancock. Reconstruction of the I-5 overpasses creates an opportunity to bridge the area between the traffic lanes and the surrounding land forming a “lid” over parts of the freeway. These lids were initially planned for “the Box” area and for the new Hancock overpass. NE neighborhoods generally oppose widening I-5. Providing a “lid” for the box was a concession to neighborhood critics. 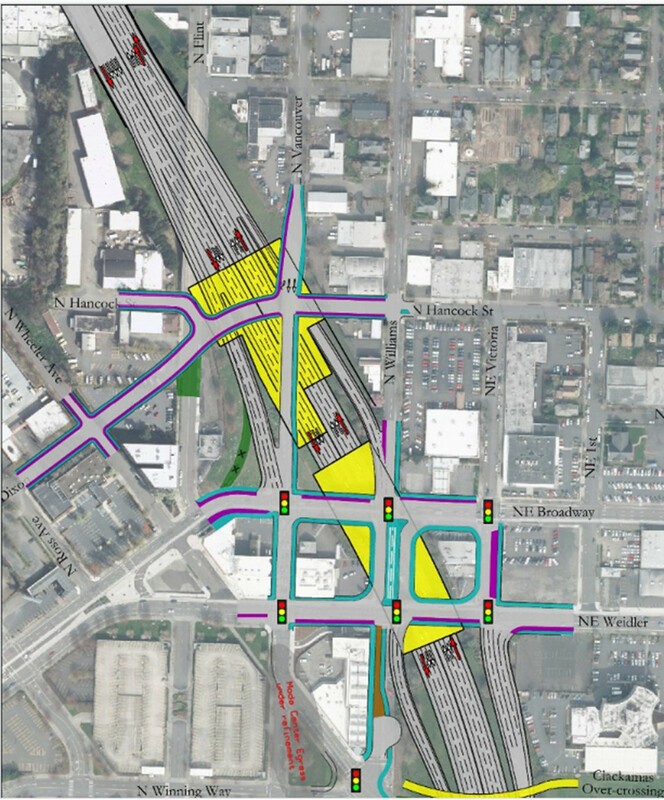 It was also justified as it will provide a temporary bypass when the Broadway/Weidler overpasses are replaced. Eliot and other NE neighborhoods also opposed the Hancock extension. The Hancock “lid” is supposed to compensate for the loss of Flint. The Land Use and Transportation Committee has been involved in this process since the beginning and would like to hear from you about this proposal. Is a concrete park fair compensation for the loss of Flint? Should a ped/bike path connect Flint to the lid/overpass? Because of the slope, should two lids be considered instead, with each anchored to the grade on each side of I-5 but not to each other? Do you consider the lid proposal a waste of money?